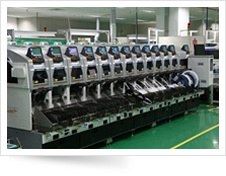 EMS site is located in Suzhou and certified for ISO 9001:2008 and ISO 13485, we offers end-to-end production capabilities including board level assemblies, modules assemblies and final product assemblies with test capabilities. The quality of the final products is assured by a pre-delivery reliability test, customized to simulate use by the consumer. The assembly lines are supported by traceability systems for statistical process and quality control. Tied to our operations is our sourcing capability and commodity management including mechanical parts, electronic parts and electro-mechanical parts to ensure a one-stop solution. We are committed to deliver the right product with the right quantity and right quality to the right place at the right time at a reasonable cost.